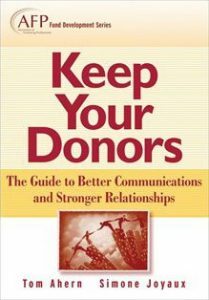 Written by fundraising experts Tom Ahern and Simone Joyaux, Keep Your Donors is a new, winning guide to making disappointing donor retention rates a thing of the past. This practical and provocative book will show you how to master the strategies and tactics that make fundraising communications profitable. Filled with case studies and based in part on the CFRE and AFP job analyses, Keep Your Donors is your definitive guide to getting new donors—and keeping them—for many years to come.